Nightlife vet Joe Russo opens musical Mecca in the South Loop. As we enter the club, Roy Ayers, Bob Marley and Erykah Badu beam at us from a backlit mural. A noteworthy late-night addition, the Shrine (2109 S Wabash Ave) perfectly complements a string of recent dining offerings on the Wabash Avenue strip in the South Loop. 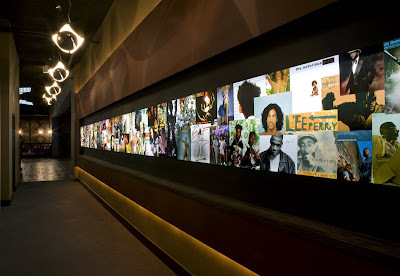 The collage of more than 75 seminal album covers spans not only the Shrine’s 20-foot-long entryway but also the musical influences channeled into this venture, the latest from nightlife impresario Joe Russo. One can’t help but notice that in the mural—a musical mission statement—the palest race is conspicuously absent. That’s no oversight: The Afro-centricity is central to the club’s theme. Kente-cloth-patterned wallpaper adorns the walls, while black-and-white photos of ’70s-chic, scantily clad Nubian models hang prominently above the main bar. When Russo, a curly haired Italian-American, describes the programming, it’s like a roll call of the history of black music. “We like to think we’ll be the premier R&B, funk, soul, hip-hop, dancehall, Afrobeat, house and disco club of Chicago,” he says during our behind-the-scenes tour. That vision has been many years in the making. Born and bred in Chicago, Russo got his start 20 years ago in men’s retail; he dressed up many of the scenesters he still considers his core clientele. “Most of my best customers at the store were restaurant owners or nightclub guys. I loved their lifestyle,” he says. His passion for fashion on the wane, Russo switched gears, becoming a manager at the Metro before setting out on his own in 1996.